The Leicestershire Sangha consists of two groups: the Leicester group meets in members’ homes within the city of Leicester and the Charnwood group meets in members’ homes mostly in the villages around Loughborough. The Leicester group meets on the second and fourth Tuesdays of each month and the Charnwood group on the first and third Wednesdays. Everyone is welcome at both groups for some or all of the sessions. Groups meet informally at 7.30pm for a cup of tea, ready to start promptly at 8pm. We aim to finish at 9.30pm. We voluntarily share the facilitation of the evenings, which follow a regular pattern of sitting meditation, walking meditation, reading and Dharma sharing, which is an opportunity to benefit from each other’s insights and experience of the practice. Every other month throughout the year, there is the opportunity to join other sanghas from the East Midlands on a Sunday for Days of Mindfulness. These are usually held in the Village Hall in Normanton-on-Soar, near Loughborough. Everyone contributes to the hire of the hall and brings vegetarian food to share for lunch. A highlight of these Days is the walking meditation which we practice in the beautiful countryside surrounding the village. 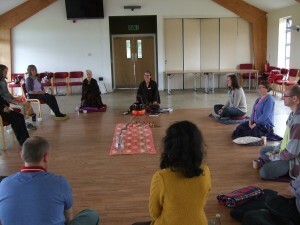 In months when there is no Day of Mindfulness, any interested sangha members can meet on a Sunday between 10.00am and 2.00pm to explore the Fourteen Mindfulness Trainings. At each meeting, one of the trainings is examined in detail so that we can begin to deepen our understanding of its relation to our lives. This is followed by a recitation of the whole Fourteen. We value the flexibility and openness of our sangha. Every meeting is open to all, regardless of experience. We welcome people from all traditions, including non-Buddhist ones, in the spirit of friendship. Leicester and Charnwood. Please ask primary contact for details (locations on map are approximate). Leicester: second and fourth Tuesdays each month. Charnwood: first and third Wednesdays. Both 7.30pm for a cup of tea, 8pm prompt start. We aim to finish at 9.30pm.